The conclusion of Witness for the Prosecution includes a message telling viewers not to give away the ending. It’s a crazy twist! We’re accustomed to surprise court cases in movies and TV today, but this wasn’t as common in 1957. This adaptation of an Agatha Christie short story and play throws a few surprises at you, but it’s hardly shocking. 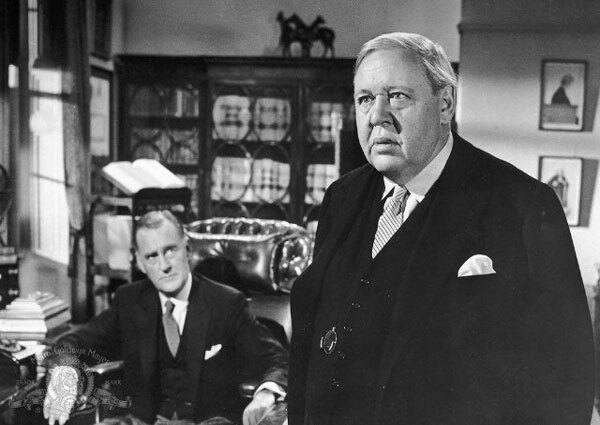 Sir Wilfrid Robarts (Charles Laughton) is fighting a serious illness but can’t help but get drawn into an interesting case. The barrister is defending Leonard Vole (Tyrone Power), who’s accused of killing an older widow (Norma Varden). He vehemently denies the charges, but his wife isn’t a reliable witness. Marlene Dietrich plays Christine, who doesn’t seem concerned with her husband’s impending incarceration. Her cold demeanor makes her suspicious right from the start, though it’s hardly that simple. The courtroom drama feels pretty typical, but it masks different motives beneath the surface than we might expect. Billy Wilder worked with Larry Marcus and Harry Kurnitz on the script, but the framework was set from Christie’s source material. The film expands the story and includes flashbacks that show how Leonard and Christine met in Germany. Dietrich takes center stage and performs a song that incites a brawl among the soldiers. The DVD packaging even spotlights the huge expense of this scene, but it feels out of place within the drama. It’s designed mostly to show Dietrich’s legs, which are impressive well into her 50s. 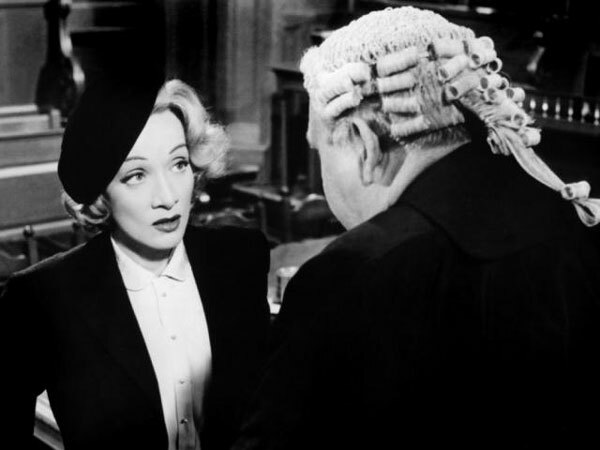 Even so, Power and Dietrich have little chemistry because he’s just a straight-arrow actor. He’s charged for murder but can’t shed his persona as the man in the white hat from past roles. Thankfully, the great Charles Laughton (Spartacus) steals the show and makes Wilfrid the most interesting character on screen. We care more about his health problems than the verdict of the case. He received a Best Actor nomination for the part and deserved the recognition. Laughton’s wife Elsa Lanchester brings much-needed levity as Miss Plimsoll, his frustrated nurse. Wilder adds their banter and keeps the story from becoming too procedural. They have the relaxed connection of a long-time couple and get plenty of mileage from her exasperated reactions. Laughton plays Wilfrid as a guy who understands that he may kill himself, but his brain can’t help but accept the challenge. He doesn’t seem convinced that Leonard is a good guy, yet the murder doesn’t sit right. When the verdict is announced, it feels too easy and doesn’t gibe with Wilfrid’s inquisitive mind. Dietrich’s performance is tricky because it seems generic yet masks a lot more underneath it. When all is revealed, it makes us reconsider both her character and the work behind it. It isn’t one of Wilder’s standout films, but the writing and memorable performances keep it interesting. Laughton is also known for directing The Night of the Hunter, and that understanding led to a great working relationship with Wilder. They create an intriguing character that lifts the material and delivers an engaging film. I was entertained by Wilder's film, agree Charles Laughton's performance was the stand-out. A message telling viewers not to give away the ending, I recall seeing that in Diaboliques (1955) as well, maybe it was a 50s thing? It's possible. It made me think of the ploy for Psycho of not allowing people to arrive late. That was part of their marketing campaign. I think films were really battling TV at the time, so having this message could inspire people to tell their friends to see it so they could talk about it. It did feel a bit strange hearing it today. I agree with your conclusion here. The things I remember most are Laughton's performance and his bickering with Elsa Lanchester. I think that's the general consensus, and I'm not as familiar with Dietrich's career to recognize how important this role was for her (if that's the case). I knew very little going in and think it was worth seeing.